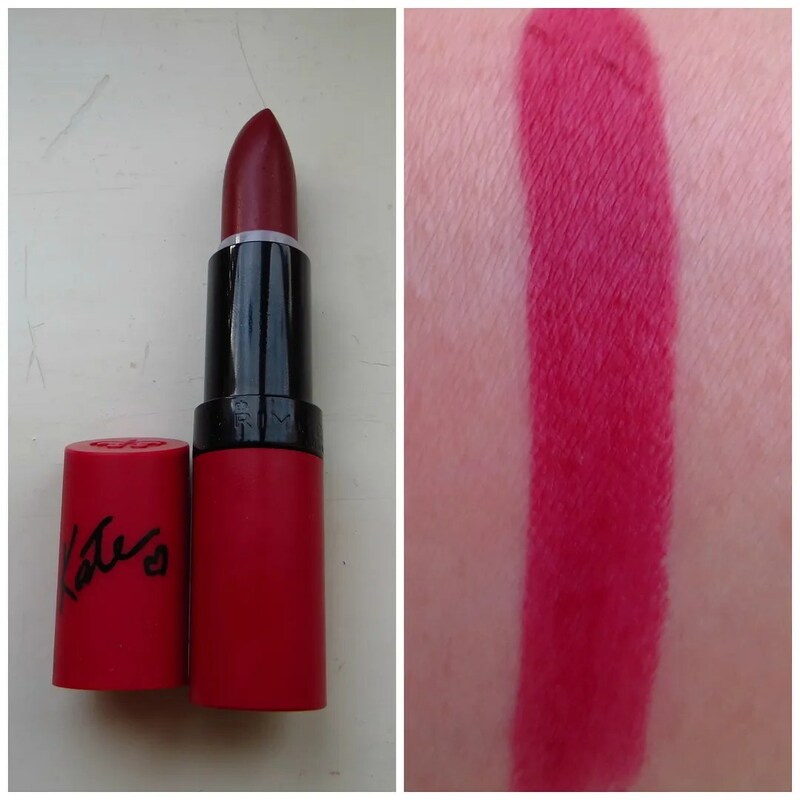 After posting the first part of my red lipstick collection last week, I am bringing you part 2 today. 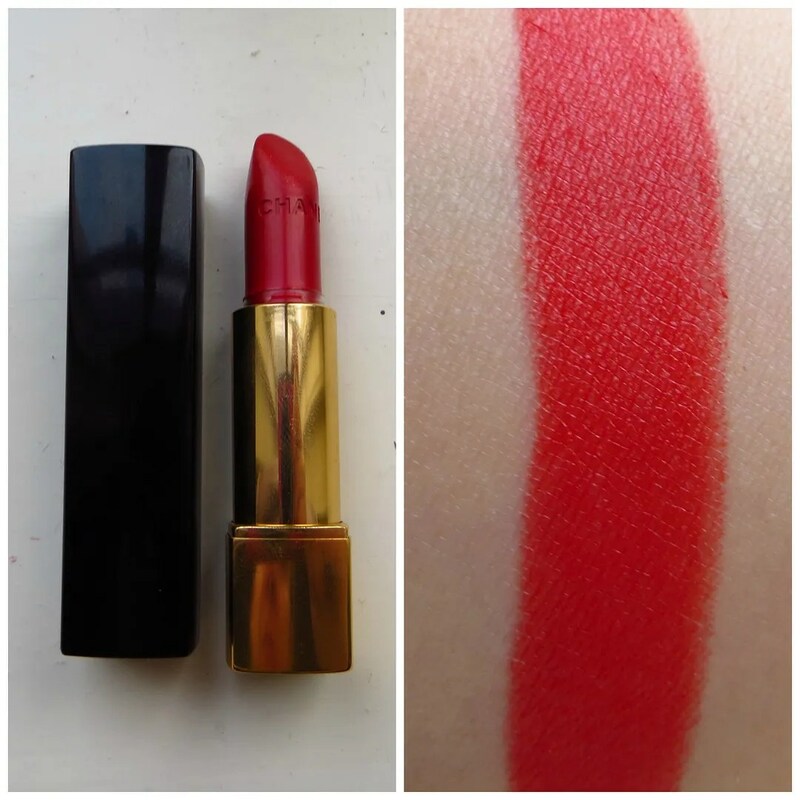 You can read the first post, containing my high end red lipsticks, by clicking here. This second half consists of budgetproof drugstore options. 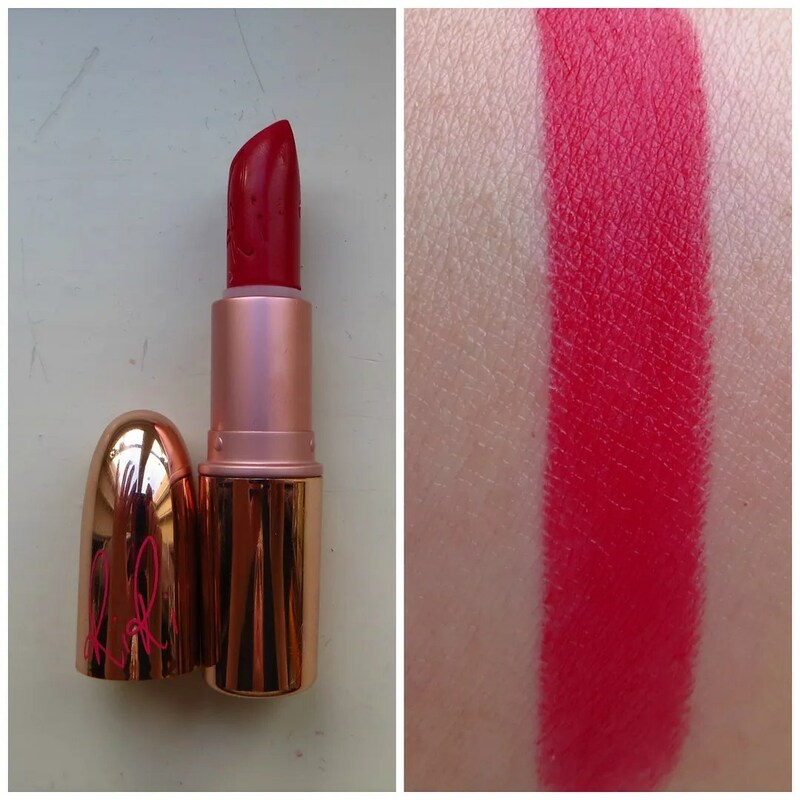 So if you are looking for a cheap to mid range priced red lipstick, then this post gives you 11 options including swatches to feast your eyes on. Some may be more widely available than others, but these can generally be picked up everywhere. Again: I didn’t purchase these in one go, and I will point out my favorites and say a bit about each lipstick as we go along. Enjoy! Oh and do leave a comment below telling me what your favorite lipstick is! I’m always looking to try more. Berry red color with a slightly metallic shine. Stays on for an okay amount of time but not too much. I’m not a big fan of shiny lipstick which is why I don’t wear this color all that much, but with the right outfit this can look great on. Max Factor doesn’t come cheap though. For the price I think you can find better lipsticks in a similar color without the shine that last longer too. My favorite subtle red lipstick. Who knew there was such a thing as a subtle red lip. The name is very apt: this lipstick gives your lips just the right amount of color, as if flushed by a fresh kiss or biting down on them. Very creamy texture so it doesn’t last long, but it’s not very expensive either. 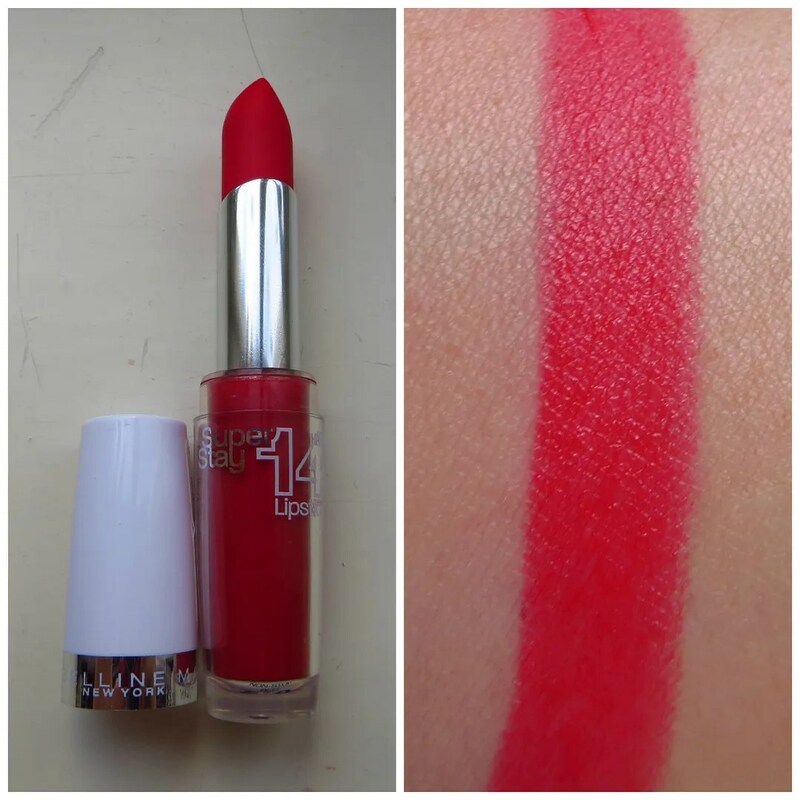 If you are looking for a red lipstick that allows you to ease your way into wearing reds, I can highly recommend this one. 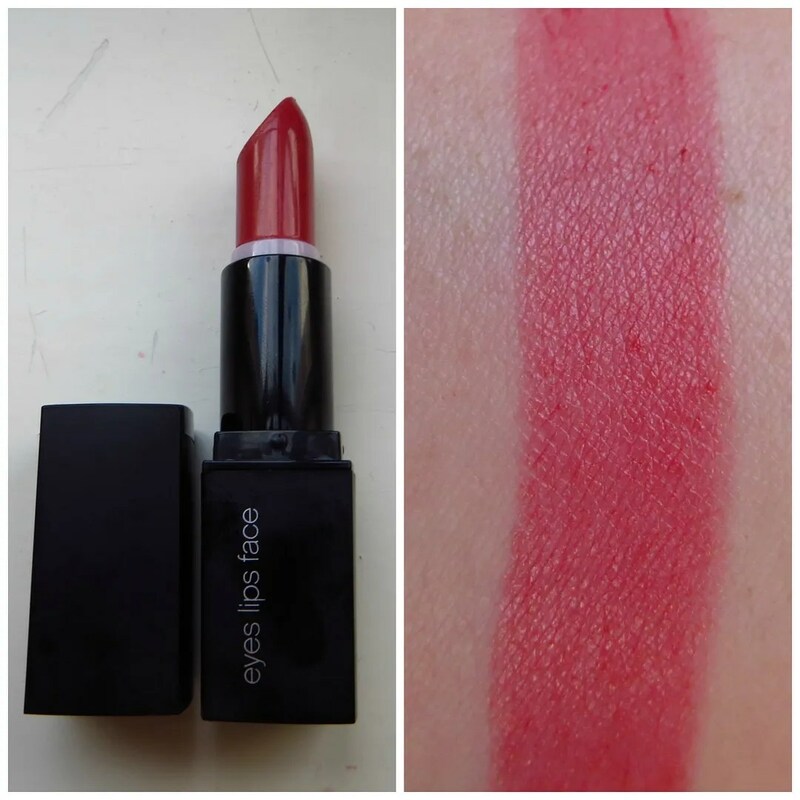 Long lasting lipstick with a pinky red color. It’s the only pink undertoned red in my collection. Because of the 14 hour formula this thing won’t budge and will last you all day. For those of you who may have seen my current Facebook profile picture, I’m wearing it in that picture. That day I attended my family’s annual family reunion and this thing was on my lips from early afternoon till I got home 12 hours later. And that’s after plenty of drinks and food. Not very cheap, but Maybelline is on offer plenty of times. 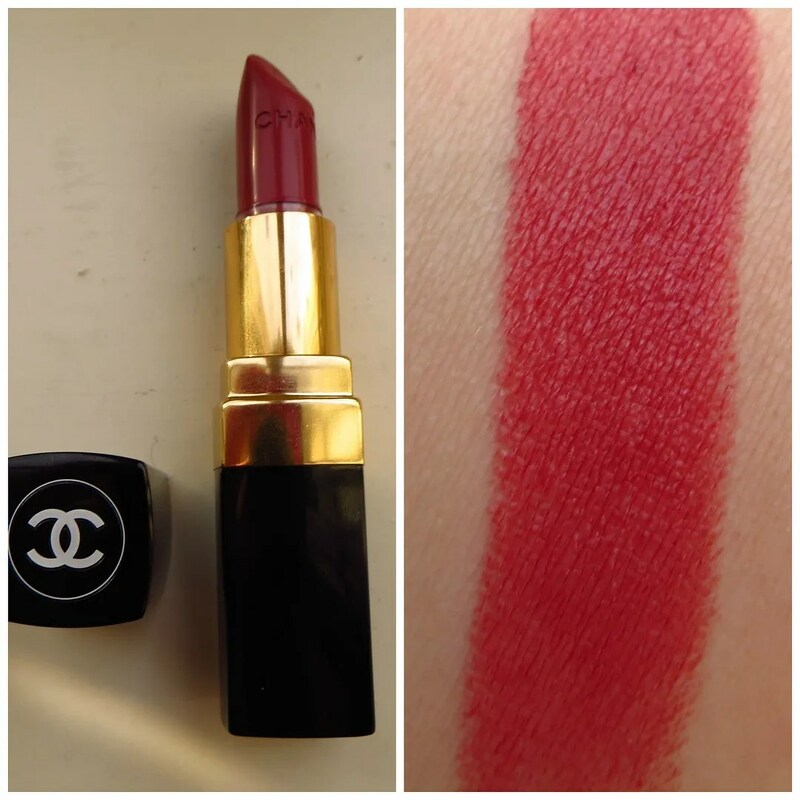 One of the oldest red lipsticks in my collection and one I’d have to say I had quite forgotten about until I made this post. I should wear this again soon. I do remember this not lasting very long as it’s very creamy. It’s probably why I don’t wear it a lot. The color is pretty though. It reminds me of a very juicy, over ripe raspberries. Yum! 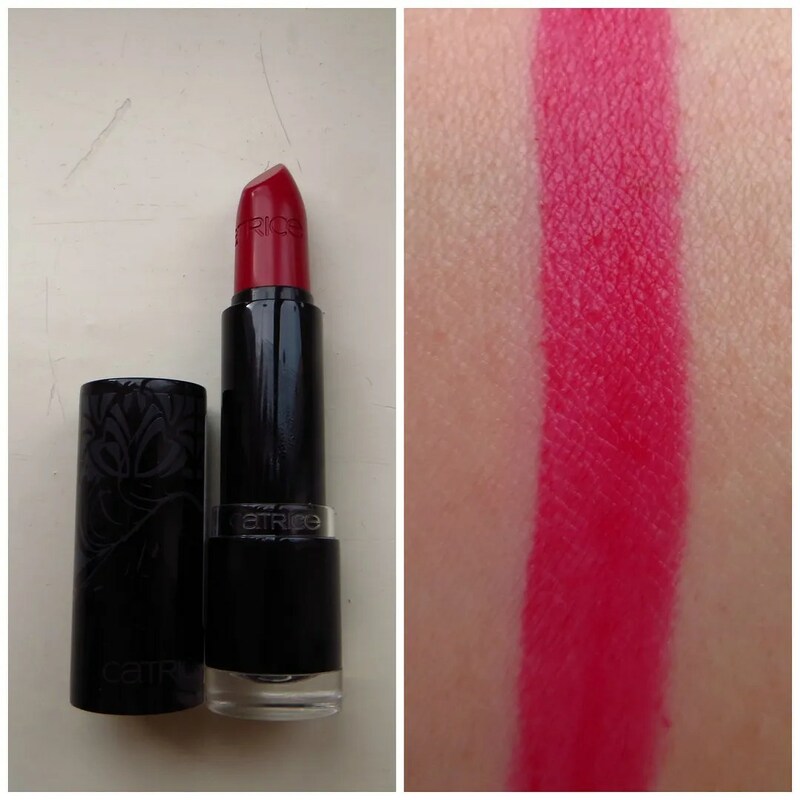 This LE lipstick from Catrice came with their Great Gatsby themed holiday collection and if you look at this picture and the one above, you can see that these lipsticks are almost identical. I’d say the Catrice lipstick is a tad brighter and has more pink in it though. Like all Catrice lipsticks, this lipstick wears beautifully and works like a charm. Catrice really does some of the best budget lipsticks out there. Excuse the blurriness, but light is sparse this time of year, so I hope you can still make this out. 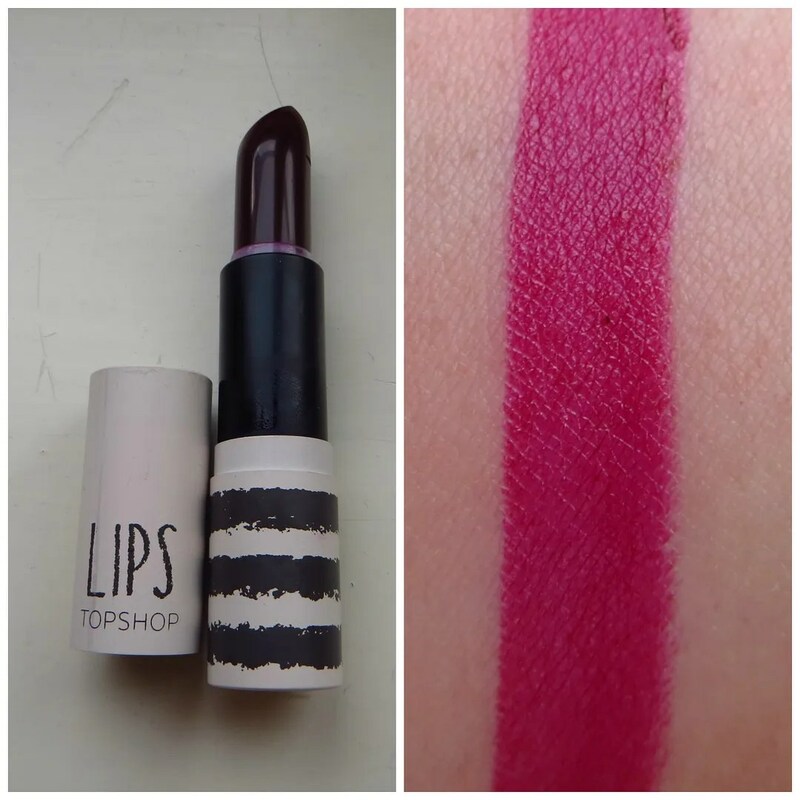 If not, then simply search this lipstick on my blog, because this isn’t the first time it’s featured on here. It’s been in my favorites for September last year as well as the rainbow tag. 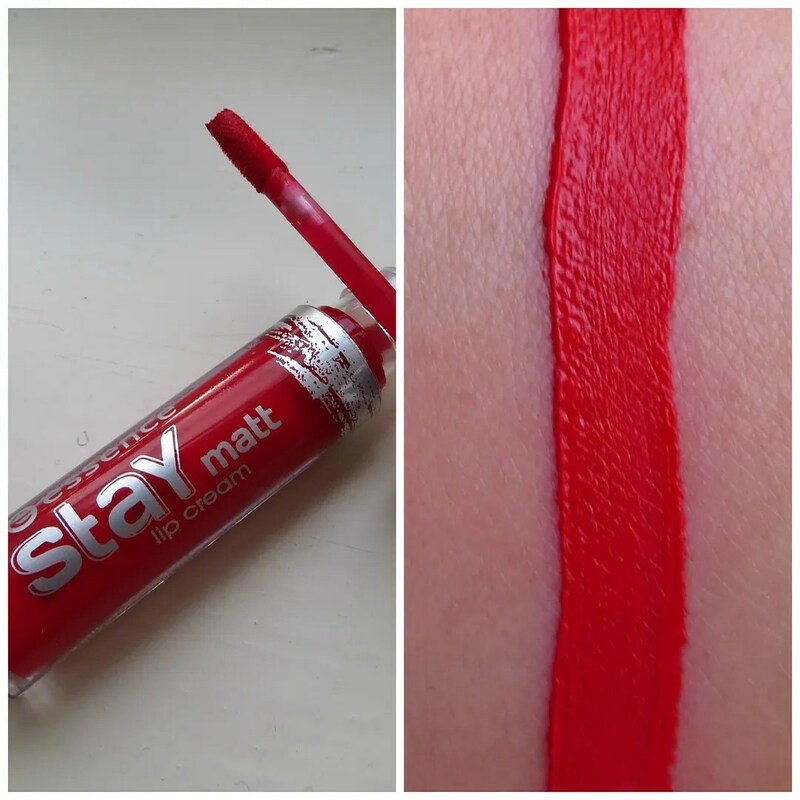 A great, wallet friendly orange-toned red at only 8 pounds, that is matte and lasts all day. My favorite lipstick hands down. And because that orange-toned red was such a success, I also bought this wine colored one when I was in London in October. Same texture and lasting power as the one above. Just a different color: red with a purple undertone. 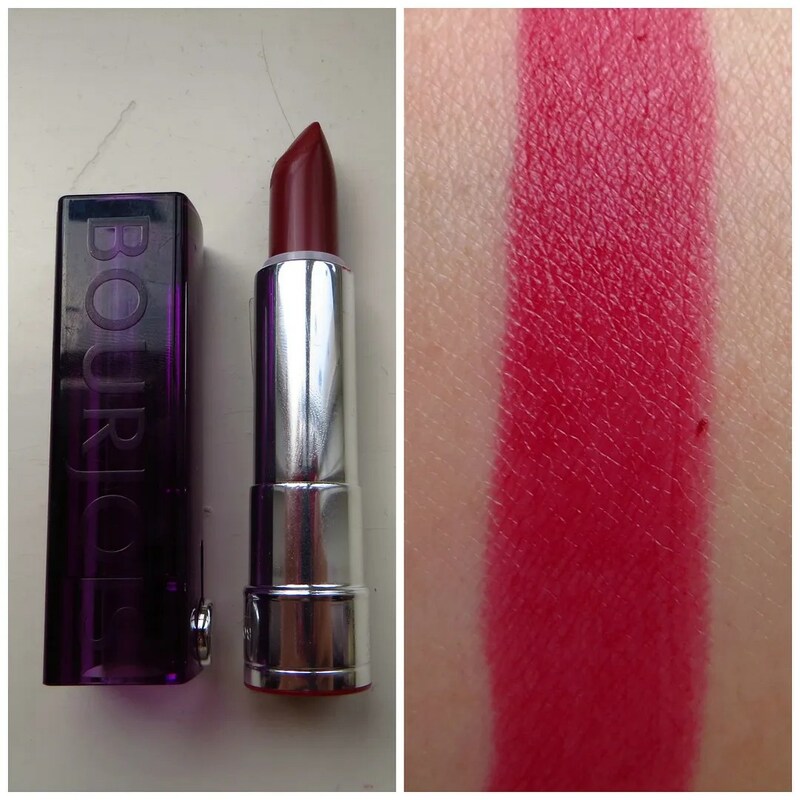 When I swatched this next to my Illamasqua lipstick in Shard, I found that to be a tad more purple (and too purple to count as a red), but if you are looking for a more budget friendly version of that, which is also available year round, I suggest this one. In other words: A + Amazing. On to the king of budget proof make up when we only account price: Essence (not a big fan of Essence overall, I’m afraid). With introducing these longwear lipstick one of their semi-annual collection changeovers they definitely got something right. Great pigmentation, nice lasting power, good texture and an array of pretty colors. 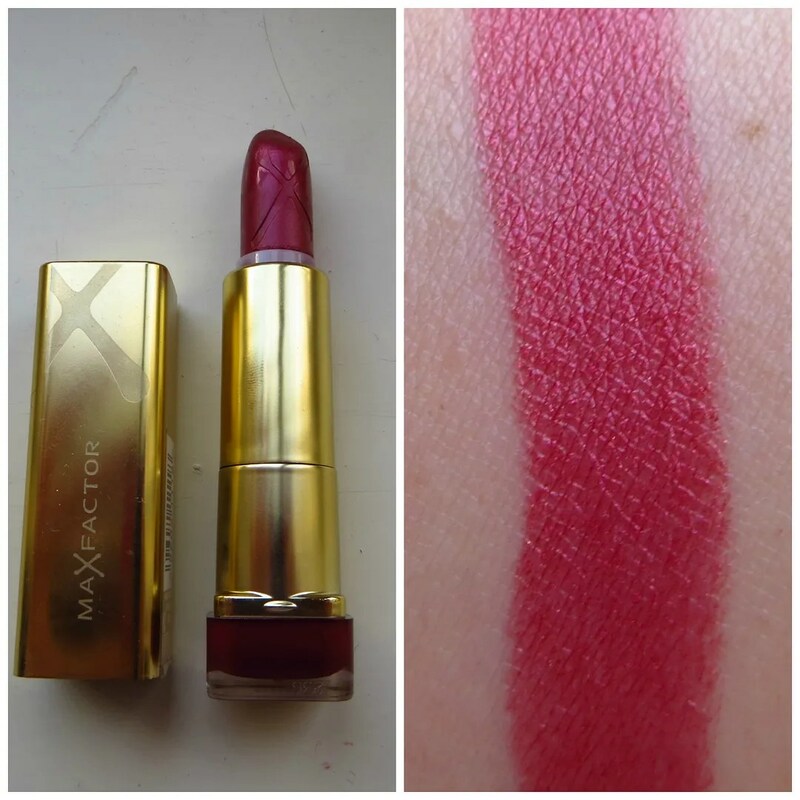 Another raspberry red, but again a bit brighter and more pink than the other lipsticks featured in this post. Talking about changeovers: soon enough Essence will change their offerings again and this beauty will then unfortunately bite the bullit. This is one of those lipsticks formulated as a lipgloss type products. I find them a tad messy to work with, but can you say: OMG pigmentation and OMG matte! And for only a few euros at that. So sad to see these go! Saving the best for last! 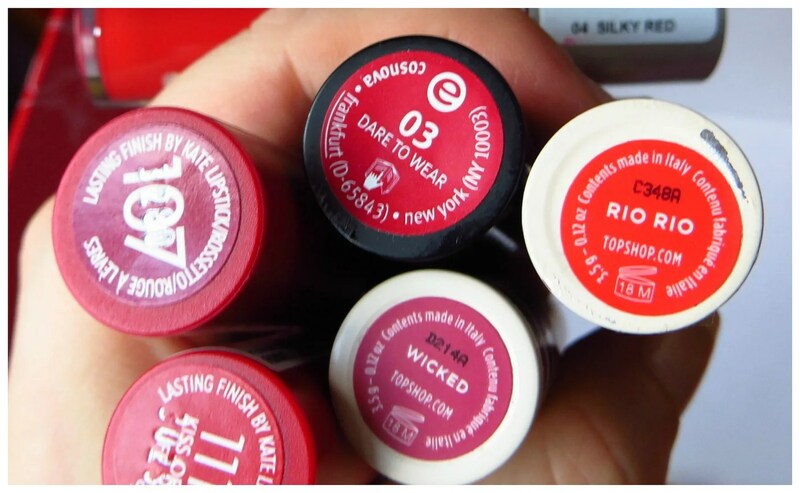 Matte lipsticks look ages to make their entry in drugstores, and Rimmel was one of the first ones to make them available at an affordable price. 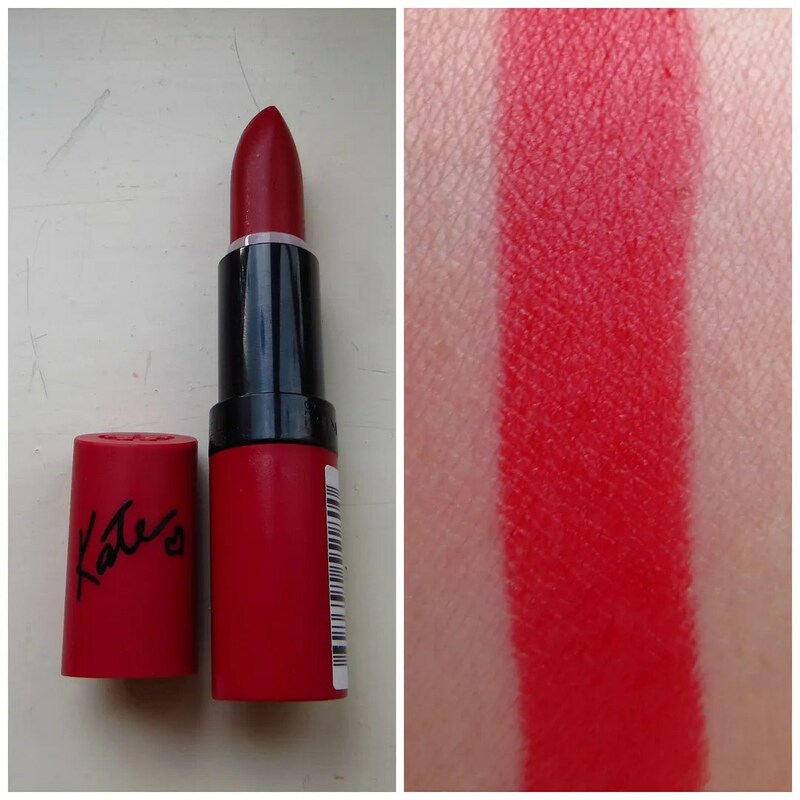 Their red-packaging Kate Moss line is an absolute hit and features this amazing classic red lip. It does dry your lips out a bit when you wear them all day, but once this thing is dry it won’t budge. Lasts a bit less long than the Topshop one, but still good enough for an entire work day. Finally, one thing on my wishlist had been a matte berry colored lipstick. And I found it in this one. 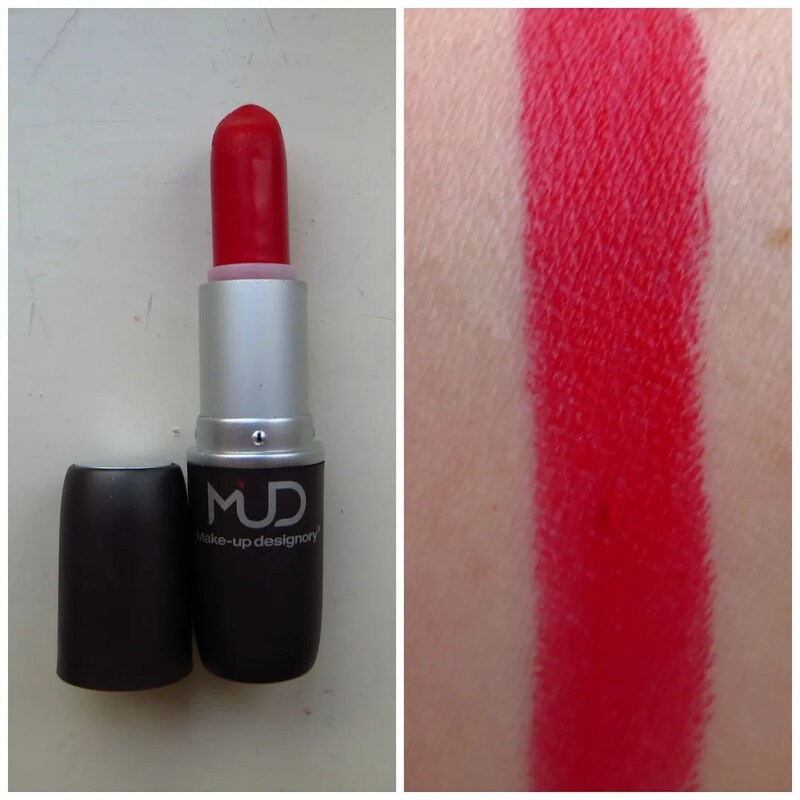 Same texture and staying power as the brighter red and I always receive tons of compliments when I wear this. It’s a dark berry color that really suits me: it has enough purple to make it dark, a hint of pink to brighten it up and enough red to make this one stellar color. What’s your favorite lipstick in the world? 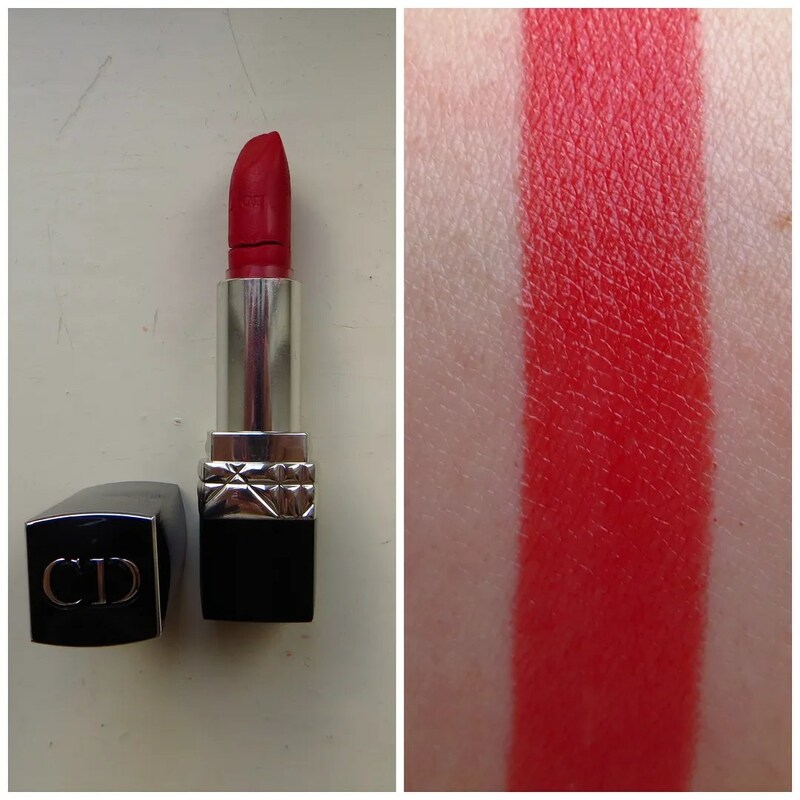 About 500 posts ago, when I posted a blog concerning a new red lipstick, I promised I’d make a post on my red lipsticks. In other words, this post is long overdue and by now, I can’t even stick it into one post anymore. The red lipstick collection now holds 20 lipsticks in total, with an almost 50/50 spread between high end and drugstore brands. 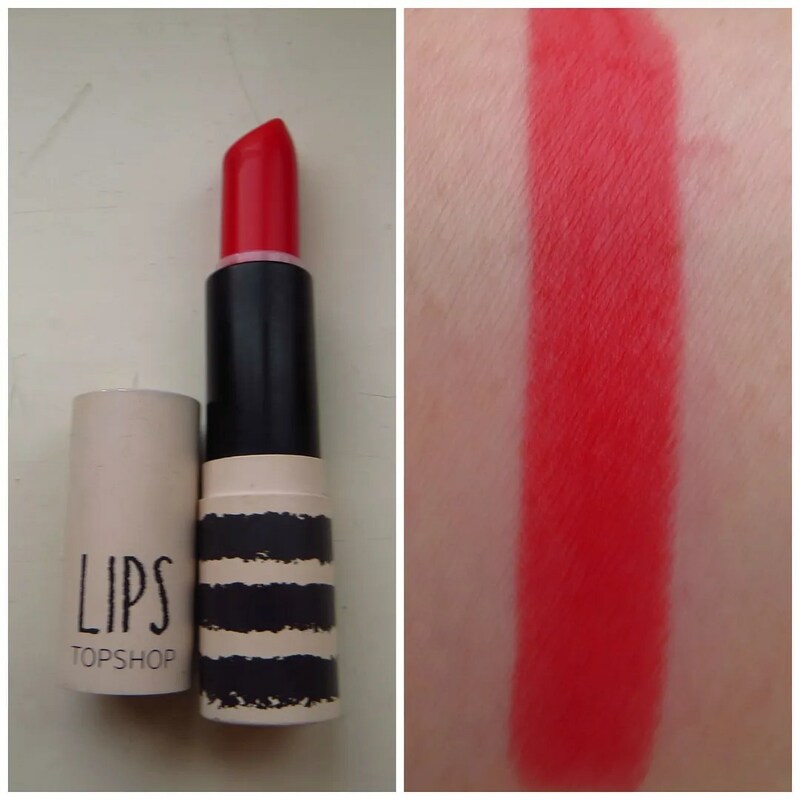 Today I’ll be showing you part one of the collection, which consists of 9 high end lipsticks. 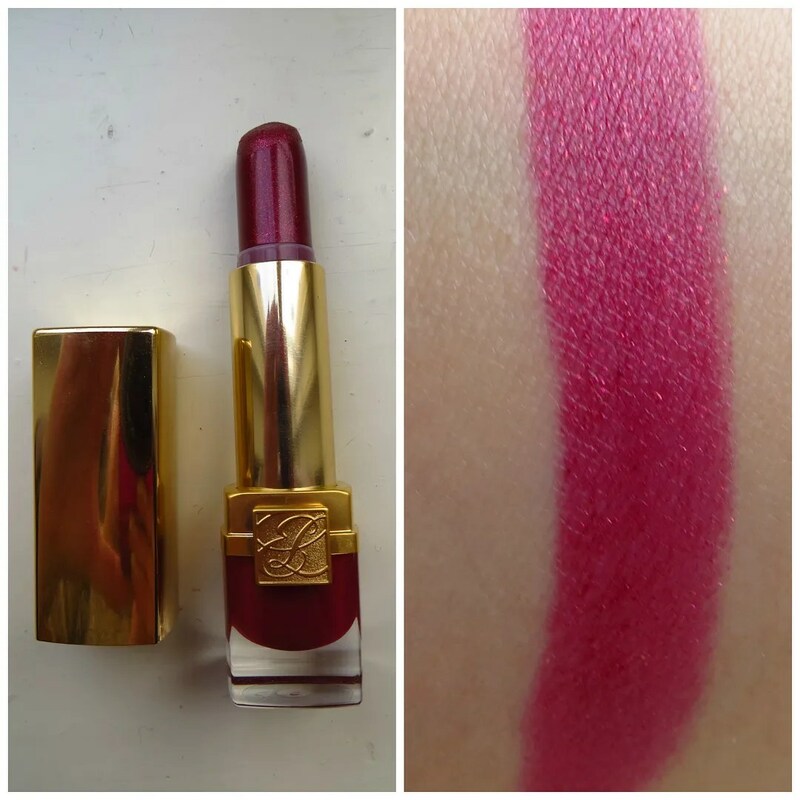 All I can say is: enjoy and regard the prettiness in both lipstick and swatch in the pictures below. Before I get into the prettiness that is my red lipstick collection, I would like to point out that I didn’t purchase these lipsticks in one go. In fact some of these I’ve had for as long as 4 years. I tend to think carefully before I purchase high end lipsticks and on all occasions I tried these on before I took them home. And to answer the obvious question: does a girl really need this many red lipsticks? No. But I like trying new things and I tend to wear different shades in different seasons. Plus these also have a different texture and lasting power of which I will inform you below as well. Creamy red lipstick with a brownish undertone. Looks not so nice in the tube, and I wouldn’t have picked it if a make up artist at the Chanel counter at KaDeWe in Berlin hadn’t slapped this on me and showed me how great this looks on. This was my first red lipstick and it’s extra special as I bought it in Berlin. Doesn’t last too long because of the creaminess. 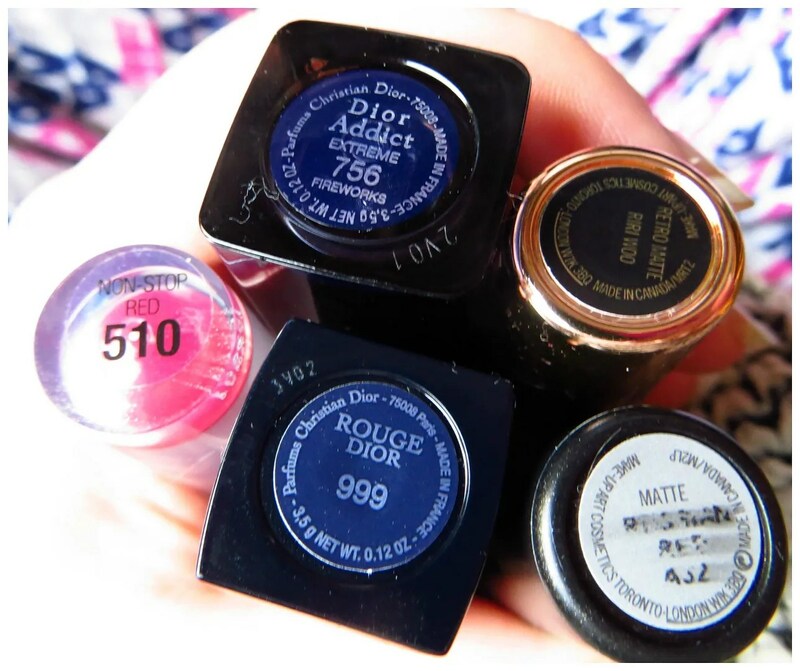 Now you know a lipstick color is bang on when it does not only come as a lipstick but also as a nail polish! This baby is opaque, lasts a life time and comes in the insanely luxurious packaging with the click tube. One of my prized items in my make up collection. This purple toned red couldn’t have been more aptly named as it has the color of overripe raspberries. Looks more burgundy red on the mouth and has an insane amount of sparkle to it. Lasting power is great and I love this in fall/ winter. A perfect bright, in your face, fire engine, matte red. This red goes about as classic as classic red goes and what’s more: it lasts ALL day. That’s right! I wore this to work from 9 – 5, had lunch AND dinner with this on and by the time I went to the gym around 9 PM this baby had faded, but most certainly still visible. This came in a set with a matte eyeshadow palette, which I ordered online some years ago, so I don’t know if they still sell this. 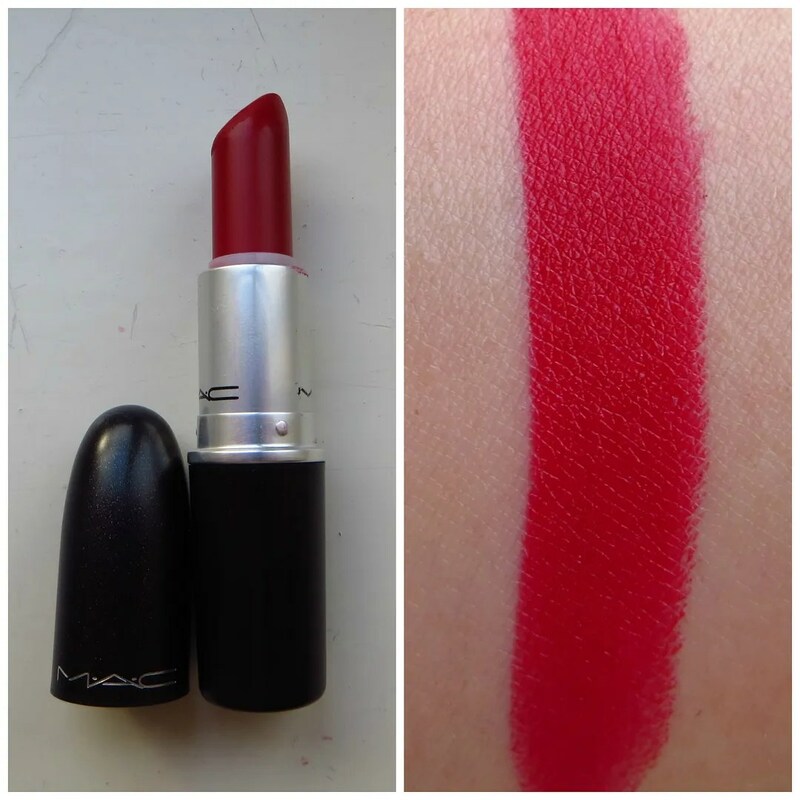 My first MAC red lipstick. Again a classic red color, though not as bright as the previous color. Hence why I tend to wear this more in the darker months. I love wearing this to work as well, as it again lasts a long time and looks classy with a number of outfits and make up looks. The much coveted Riri Woo lipstick from the Rihanna collection in the rose gold packaging. When I saw this color on Beauty Blogs the world over, I instantly fell in love and knew I wanted this. Once I got this home, I thought this looked similar to Russian Red at first glance. However, if you look carefully, you can see that Riri Woo is more of a blue toned 50s red than Russian Red and not as fire engine red as Lady Bug by Make Up Designory. This does feather though, so you can’t go without a lipliner with this. 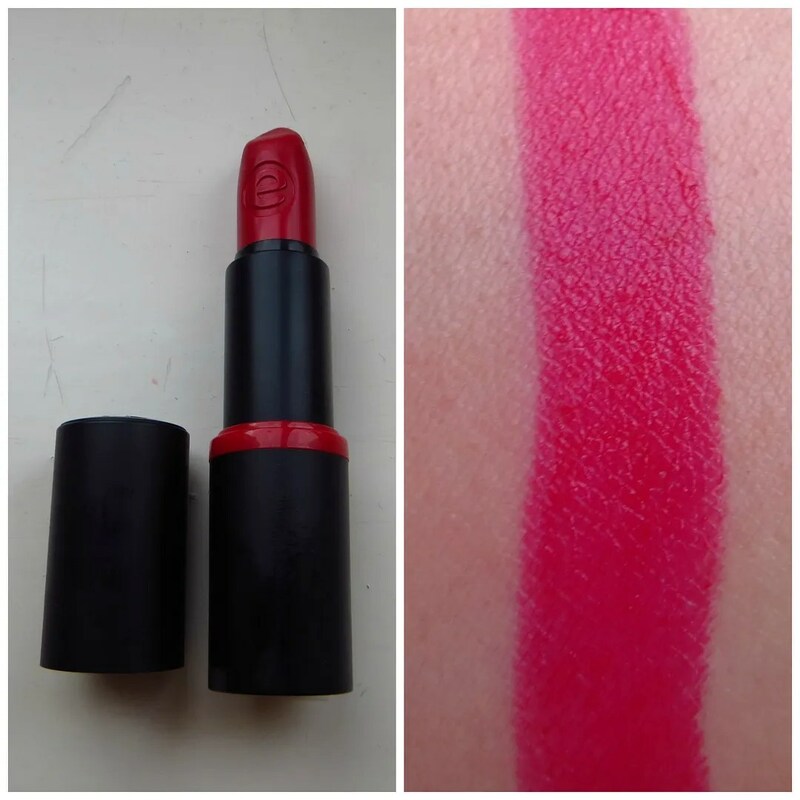 And then on to the biggest lipstick fail of the century: my Rouge Dior 999. 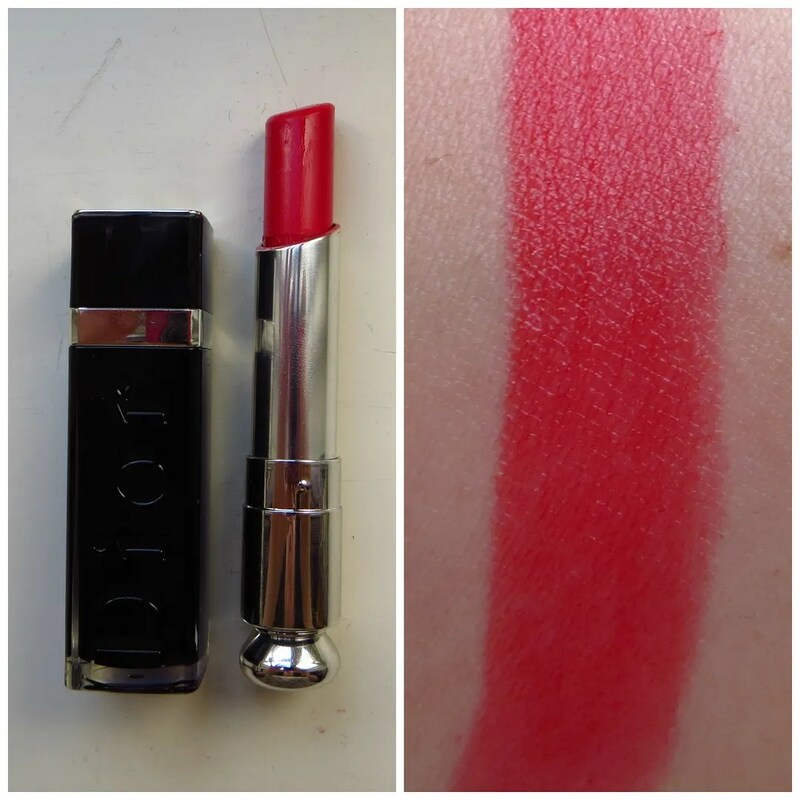 THE classic Dior color and what does it do BEFORE I had ever used it? Yep it chipped AND broke on me. Can I please sit in a corner and cry? I have since tried to glue this baby back together twice, but alas to no avail. I’ll just keep it in it’s tube and use a lip brush to apply. Creamy texture, hence it doesn’t last too long and a bit more on the orange side in the red specter. 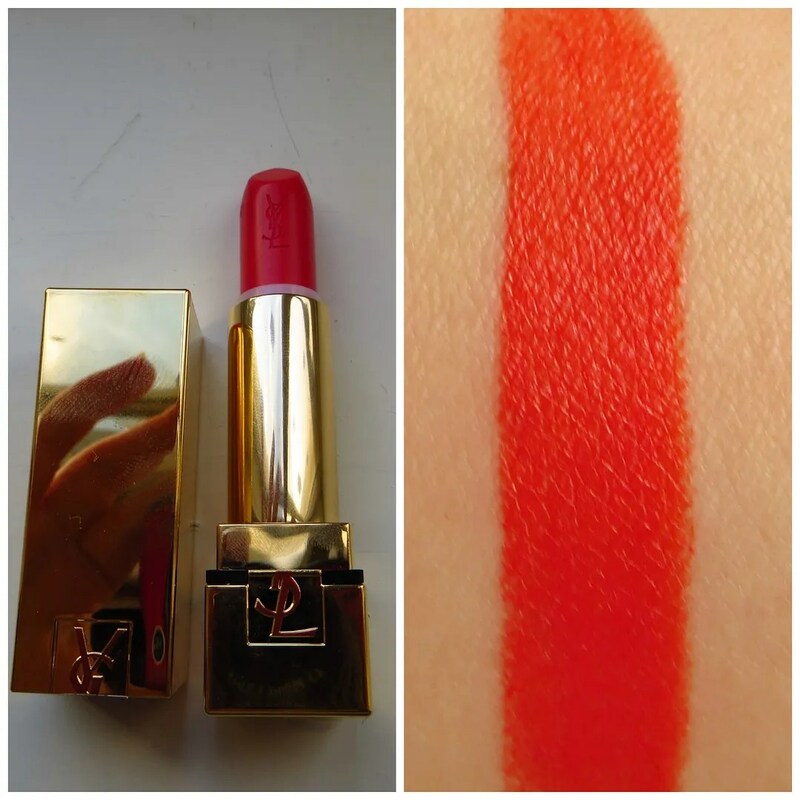 Part of YSL’s winter collection, this lipstick instantly caught my eye when I saw it in stores. It is a BOOM: in your face red that pulls into the orange range more than red. Unfortunately this swatch photographed hideously as my camera makes the entire frame orange. Trust me, I tried but this is the best it did under the current lighting circumstances. Care to see more? I reviewed it earlier this month in this post. And that is the end of part 1 of my red lipstick collection. I hope you find this useful as an overview of how many different shades of red are out there and what might look nice on you. Reds can be difficult as it really depends on your complexion. Luckily, with my pale skin, I can pull of lots of different shades, which is why it’s my favorite lipstick color. Stay tuned, because part 2 is coming up next week! So if you’d like to see some of my cheaper lipsticks from brands such as Essence, Catrice and Rimmel than keep your eyes peeled. Do you wear red lipstick at all? If so, what’s your fave red lipstick?